This document describes a variety of ways to collect visits to multiple domains in a single view (profile)—as if they were a single site rather than two separate ones. It also covers how to track portions of a website, such as sub-directories and iFramed content. If you are unfamiliar with the general process of cross-domain tracking, see About cross domain tracking. A default setup of Google Analytics is designed to track content and visitor data for a single domain, such as www.example.com. IFramed Content—visitor and pageview data for content in an iFrame of another domain. In any of these cases, you'll need to do some customization to the tracking code in order to correctly track visitors. Before doing this, it's a good idea to read how Domains and Directories are treated in a default Analytics installation. This section covers a variety of tracking scenarios, ordered by the most popular methods. In this scenario, you might want to track two unique domains and one sub-domain. For example, suppose you have an online store and you also want to track visitor and campaign data to your blog. The following shows key tracking code customizations for three example URLs. The only links or form data that you need to customize are those that point to www.my-example-blogsite.com. This is not required for links to the sub-domain of this site, since the _setDomainName() function defined .example-petstore.com as the domain to enable cookie access for any other subdomains. Links back to the primary domain do not need configuration because the sub-domain shares the same cookies with the primary domain. This configuration sets the domain name to the top-level domain for the blog site. In this way, if you later add any sub-domains for the blog site, that sub-domain will be able to share cookies with its parent and you will not need to set up special linked calls between them. However, you still must use the _link() and _linkByPost() methods for any form or links to www.example-petstore.com. As mentioned above, a default setup of Google Analytics is designed to track content and visitor data for a single domain, such as www.example.com. This means that even if you manage both a domain and a sub-domain, you must make modifications to the tracking code in order to share visitor data across both domains. For this setup, you would use the following key customizations for the tracking code on all three domains. You will not have to make any adjustments to the links or forms between these three sites, since they can all share the same cookies due to the fact that you set the domain name to the top-level domain (e.g., example-petstore.com). Another common tracking scenario is to track visitor and traffic data between a single domain and a sub-directory of a different domain. This might occur when you want to track traffic between your website and your online blog, where your blog is limited to a sub-directory of the blog service. The follow example URLs each contain recommended customizations for the tracking code on both pages. 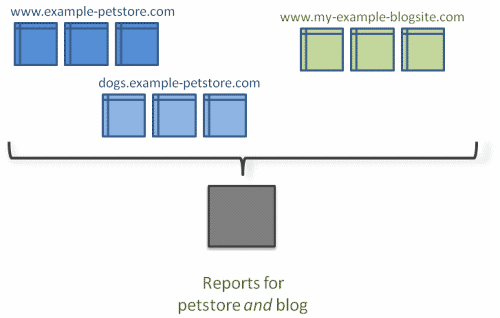 For any form submission from www.example-petstore.com to the shopping cart website, you would use the _linkByPost() method to copy traffic and visitor cookie data via HTTP POST to the shopping cart site. The _setAllowLinker() method directs the target site to read cookie data from the POST data rather than from the regular user session information. In this way, you can pass cookie data set on one domain to another and thereby retain the visitor session from your online store to your shopping cart. Similarly, use the _link() function to transfer visitor data on any links going from the online store to the shopping cart. The following example illustrates only the linking function and assumes that cross-domain tracking is configured in the tracking snippets for both domains. iFramed content that is hosted in a separate domain from the parent page is regarded as third-party content. The default privacy setting for Internet Explorer 6 and above does not allow third-party websites to store cookies on the first-party site. You have access only to a sub-directory of a larger website, such as when you use an ecommerce hosting service. You want to limit tracking to a sub-directory of a larger website, such as when you launch a project on your company's website, which also uses Analytics tracking. Suppose you have a view (profile) in your Analytics account where you track visitor data to online presence, which is only part of a larger website host (such as a blogging service). Your site itself is hosted on www.example.com/myBlog/. You only want to record visitor and campaign data for the /myBlog subdirectory, and not for any other page on the example.com domain. In this case, you also only have access to those web pages included in that sub-directory. Once this is set up, your reports will correctly display visitor and campaign data only for your sub-directory. This is because the cookie path is set to your sub-directory rather than to the root directory of www.example.com and your view (profile) will read and write to a unique set of cookies for your store only. Other Analytics account cookies set on www.example.com can be shared by your account. This means that visitor statistics like new vs returning, time on site, and number of visits might be incorrect, since your visitors' session cookies might also reflect activity on other parts of www.example.com. Your reports might reflect campaign details from another part of the site. For example, suppose a visitor clicks on an email campaign that goes to another site on the same domain: www.example.com/theirBlog. In this case, the referral information in the visitor's cookie is set to the campaign named Latest News on Blogging. Later, that same visitor returns directly to your site by typing www.example.com/yourBlog in the browser and purchases a subscription to your blog. Since all other campaign referrals persist over direct visits, you will see the campaign Latest News on Blogging generating sales for your subscription. This is because the _utmz cookie for your online store was not set uniquely for your path. If you are tracking visitor and referral traffic for a sub-directory, you might also want to set up an Include filter to the sub-directory to ensure that only content for that sub-directory shows up in your report. See the pre-defined filter article in the Help Center for more information. If you are setting up sub-directory tracking on your domain, you should also ensure that Analytics tracking is disabled for the root path (e.g. /) and any pages beneath it. For example, www.example.com/index.html should not have Analytics tracking enabled if you want to track subdirectories for the site separately. If tracking for the root path is not disabled, 2 sets of cookies will be set for a page where you have set up path-level tracking, one set for the subdirectory and one set for the top-level domain. In this case, a unique cookie is set for the domain, limited to the first directory provided, and the same cookie data is also copied over to the second directory provided. Because both sites reside on the same domain, you will not need to alter any links or form data between the two directories. This section will help you troubleshoot your cross-domain tracking setup by providing detailed information on the key components and how best to use them. Set up a master view (profile) for your primary domain without filters. Because you'll want to use views (profiles) in a special way, for cross-domain tracking, it's first recommended that you set up a master view (profile) for your primary domain. This view (profile) should have no filters added to it. In this way, you will always have baseline historical data for your primary domain that you can refer to if you make errors when setting up filters in your cross-tracking view (profile). Create a view (profile) especially for cross-domain tracking and re-use your tracking code. After you have set up a view (profile) and retrieved the tracking code for your primary domain, use the same tracking code for all other web properties. In this way, your configuration will be set up correctly before you start cross-domain tracking and you will also have historical data for all web properties. If you followed the recommendation for setting up master views (profiles), this should be simply a matter of creating an additional view (profile) for your primary domain using the same tracking code provided in the master view (profile). All other web properties that you want to link should also have the same tracking code on them. Modify your cross-domain view (profile) with a filter to show the full domain in your content reports. In the View (Profile) Settings page, click the Add Filter link. Choose Add New Filter and provide the filter a name. Choose Custom Filter and select Advanced on the Filter type settings. Set the values for both Field A and Field B to (. *), which is an expression that captures all characters. Set the Output To --> Constructor option to Request URI and provide $A1$B1 as the value for that choice. This will capture the www.example.com portion of your URL and include that at the beginning of your page URL in the content reports section. The passing of the cookie data via these three methods links two page views under a single session. If a user independently visits two sites that are tracking in the same view (profile), such as through a bookmark, these visits will still be counted under separate sessions. In this scenario, the linking methods are not invoked, and thus there is no way to determine the initiating session for a given user. To really understand cross-domain tracking, it helps to understand that cookies are identified by a number of fields and that they are not shared between domains by default. In addition, cookie sharing is automatically turned off in Analytics. This is because in many cases, sharing of the same cookie between domains is undesirable. See Significance of Cookie Identification and Expiration in the Cookie Reference. In addition, Analytics adds an additional integrity check to cookies by default. This method sets the domain field of the cookie to the string provided in the parameter. With this method, you can control the domain name used by the cookie. You will ONLY have to set up linking between top-level domains because sub-domains will share the same cookies with their parents. Use this when you want to treat top- and sub-domains as one entity and track in the same view (profile). Also use this when you want to track across multiple top-level domains AND their sub-domains. In this case, you will need to using linking between the top-level domains, but not between the top-level domains and their sub-domains. When not to use it. If you are tracking a single domain, you do not need to explicitly set the domain name.